Trump's Department of the Interior (DOI) has a pattern of killing science especially studies that cast aspersions on its support for industry. This includes burying research on coal strip mining, offshore oil & gas development, sulfide ore mining and pesticides. It is not only existing research that is being buried, proposals for new studies are being quashed alongside the findings of completed research. Under Trump DOI has accommodated the fossil fuel industry at every turn. Both former secretary Ryan Zinke and his replacement, nominee David Bernhardt lend credence to the observation that the Trump administration is full of fossil fuel lobbyists. Environmental protections are being ignored as the DOI is granting expanded access to the fossil fuel industry both on land and offshore. They even support oil and gas extraction in the Arctic National Wildlife Refuge. As explained by the LA Times, a report from The Union of Concerned Scientists (UCS) explores how Zinke, "turned Interior from a steward of public lands and natural resources into a front for the mining and oil and gas industries...The UCS report shows that his ignorance isn’t limited to this one topic, nor is it accidental. His goal is to turn Interior from a steward of America’s natural patrimony into an agent of plunder, and he’s well on his way to victory." 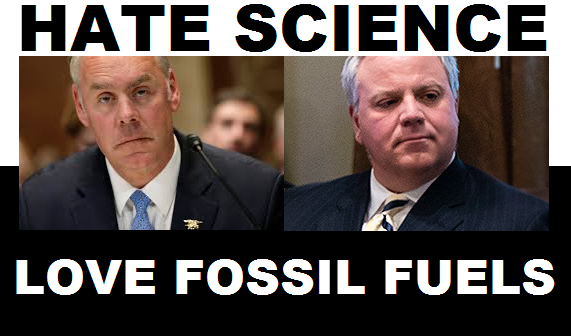 The reports lead author Jacob Carter indicated Zinke's actions were part of a systemic attempt to kill science at the department. "The intent in rolling back the consideration of science in decision-making is always to progress the development of fossil fuel interests." Carter said. "[Interior has been] freezing out advice from science advisory committees; restricting DOI scientists from communicating about their work; removing, reassigning, or intimidating scientists; and creating a climate of fear and intimidation." Zinke was forced to resign due to ethics violation, but his replacement continues to kill scientific research conducted by Interior scientists. As reported in the New York Times, Bernhardt has recently blocked the release of pesticide research at the behest of industry. It would appear that the Trump administration does not feel the public has the right to know that these chemicals put thousands of endangered species at risk. Like Zinke before him, Bernhardt has a soft spot for the fossil fuel industry. He has allowed oil and gas extraction on public lands and waters and he has killed the U.S. Bureau of Land Management’s methane waste prevention rule. Bernhardt has a long history of dismissing science. He has previously revoked directives on integrating climate science and employed other devious techniques to undermine science in the department including censoring scientists. He vets scientific grant proposals and contravenes scientific integrity policies by reviewing data and draft reports. He removed references to climate change in a draft National Parks Service report on sea level rise. Bernhardt is also responsible for Secretarial Order 3360 which removes climate change from policy manual directives and Secretarial Order 3369, which limits scientific input and policy advice. He has effectively ended the work of hundreds of advisory boards and committees, including scientific boards focused on climate change. He has muzzled scientists and reassigned senior executives. With Bernhardt at the helm DOI's war with science is sure to continue.